Photograph of William M. Dudley. No date. 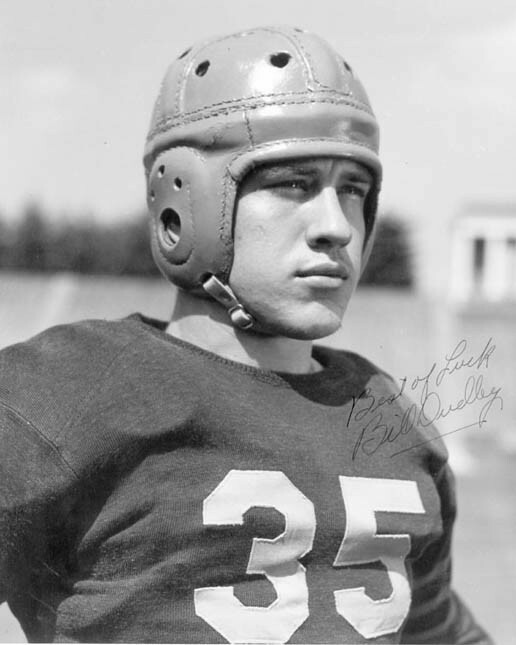 "Bullet Bill" Dudley is the only Virginia player elected to both the College and Professional Football Halls of Fame. Playing at Virginia from 1939 to 1941, he set a standard for versatility that has never been matched. He ran, passed, kicked and played defense, scoring 206 of Virginia's 279 points in 1941. The first player selected in the 1942 NFL draft, Dudley first spent two years flying bombers in WWII before returning to the Pittsburgh Steelers to lead the League in rushing, interceptions, and punt returns in 1946. Later playing for the Detroit Lions and the Washington Redskins, he was elected to the Pro Football Hall of Fame in 1966. Dudley is Virginia's first All-American and UVa's first player to have his jersey retired in any sport (#35).